“I am primarily interested in the “evolution” of surface and the relationship between the resulting artwork and human cognitive processes. I look forward to a future where computational processes like the ones that I build will themselves make artworks without the need for human intervention. The creation of such processes is something that has always fascinated me” – Paul Brown. Paul Brown’s 4^15: Studies in Perception (2006-2009) is a generative computational artwork, meaning that rather than being constructed or designed, the artist describes the work as ‘evolving’ – without repetition and without need for human intervention. While appearing to the viewer initially as a static pattern, the geometric forms and colours of 4^15 morph very slowly, so that changes are often imperceptible at first glance. This subtle optical effect rewards the viewer with the realisation that what they initially regarded to be a single luminescent image is in fact a self-generating animation. 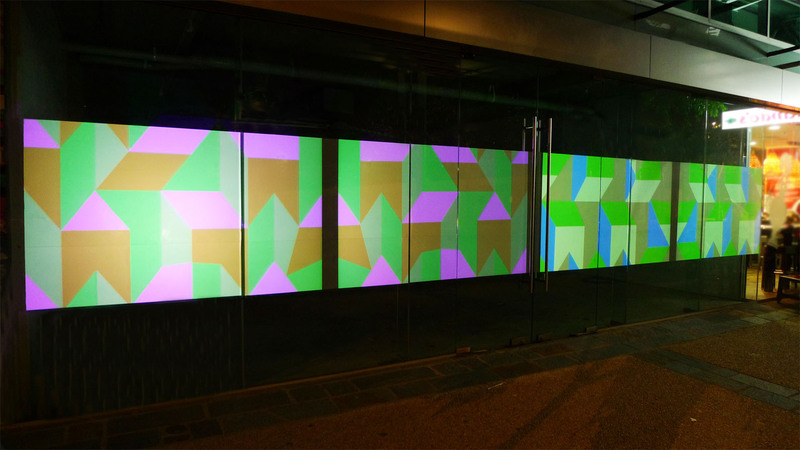 4^15 was the first artwork to be shown as part of the MAAP Republic shop-front series at South Bank. For the project, MAAP constructed a 9m x 1.5m projection space on the front window of a shop in the ABI Group Building South Bank, so that a rear-projection housed in the shop could face the popular Stanley Street Plaza in the Parklands. MAAP adapted Brown’s original artwork to the space by lining up four projections side-by-side to create a wide-screen effect that enveloped the length of the shop. Developed over a successful 40-year career, Brown’s practice evidences a deep knowledge of each art, science and technology, and a sustained curiosity in how the fields interact. Brown is renowned for his use of Cellular Automata systems, which are historically intertwined with the origins of Artificial Life (or ‘A-life’). He has applied such systems to time-based artworks, prints on paper and large-scale public artworks, referencing a mathematical aesthetic revealed in both tiling and patterns of symmetry. Brown describes works such as 4^15 as ‘kinetic painting’, with influences in European kinetic, conceptual and systems art. 4^15 was on display at South Bank from 5pm to 1pm every evening between January and May 2010.